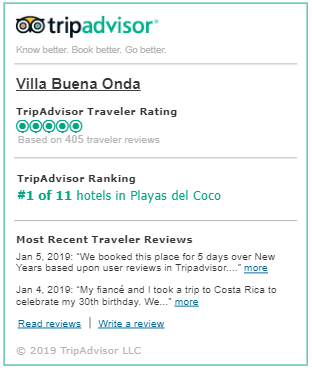 Adults-only Costa Rica Hotel - Why Choose Us? Adults-only, luxury hotel with personalized service. Treat yourself to a carefree vacation! 1. Adults-Only —We are the only boutique beach hotel in the region with an adults-only policy. Our ideal guests are couples who seek quiet, relaxation and seclusion. As such, we do not allow kids under the age of 16. This is part of what creates an ambiance ideal for couples, honeymoons or any guest looking to unwind and recharge in the company of other adults. 2. Location—Just 25 minutes from LIR Airport, we are a convenient destination for a quick getaway or an extended stay. In addition to proximity to the airport, we are minutes from three nearby beaches, each unique from the other. You have easy access to popular activities like canopy zip lining, surfing, sport fishing, white water rafting, golf, scuba diving, sailing, national parks, and more! 3. Outstanding, Personal Service—Our staff is ready to go the distance to make your stay memorable. At just 8 rooms, we have more staff than guests! Our team will make you feel like part of the family throughout your stay. We will do our best to get to know you and tailor an experience that’s ideal for you. We can suggest best tours, shopping, and nightlife. Never hesitate with special requests; we pride ourselves on providing the best service in Costa Rica. But you don’t have to take our word for it, read what guests say about us. 4. The Easiest Vacation Ever—Our hotel is designed to provide our guests with the most care-free and comfortable experience possible, whether you are booking just one room or renting the entire villa. We are happy to arrange your transportation from the airport or assist you with a rental car. Our a la carte meals-included plan removes all the guesswork of dining out. We can arrange your tours for you right at the front desk and also provide complimentary shuttle service to 3 nearby beaches. Take a look at our special offers too! After a life-time of working with and staying in hotels in many countries, we loved every minute of our stay here - we are a "grown up" family of 5 and all feel the same way. The staff at all levels have all been exceptional in their friendliness, care and attitude of "nothing is too much trouble to help you enjoy yourselves". Villa Buena Onda was designed for your comfort — from the materials and furnishings, to the quality bed linens. We aim to create an adults-only and luxury environment to beat all expectations.